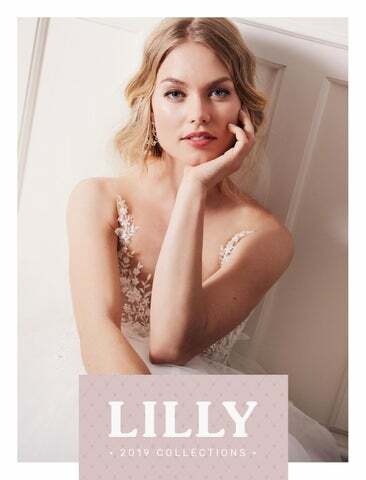 Soft flowing lightweight creations inspire with feminine silhouettes and interesting details â&#x20AC;&#x201C; LILLYâ&#x20AC;&#x2122;s Bridal collection 2019 is spectacular! Delicate transparencies on neckline and back ensure a high-necked look that veils seductively while still showing skin. Extraordinary sleeves and highcut waistlines are other highlights that combine vintage flair with a modern twist. Be inspired! 4 - 3 7 | L I L LY The ‘LILLY’ Collection for 2019 are grand dresses with subtle transparency and exquisite lace / embroidered details. 4 0 - 4 7 | P A S S I O N S b y L I L LY A spirited collection of expressive dresses in the romantic boho-fashion – with expressive cutout laces and breezy silhouettes. 5 0 - 5 5 | D I A M O N D S b y L I L LY Short and graceful dresses in tealength and figure hugging silhouettes. 5 8 - 5 9 | P U R E W H I T E b y L I L LY The new purewhite by LILLY dresses fully embrace the new ’clean chic’ look with elegant figure-hugging simplicity in a true Nordic fashion. 6 0 -7 0 | M I X & M AT C H b y L I L LY A collection of separate skirts and bridal tops for the stylish bride who wants to mix her own combination: the ranger offers a variety of skirts in different widths, lengths and materials to be combined with collections of high fashion lace tops. Enhance your personal style with beautiful accessories. MIX & MATCH YOUR FAVORITE TOP, SKIRT, DRESS & JUMPSUIT!